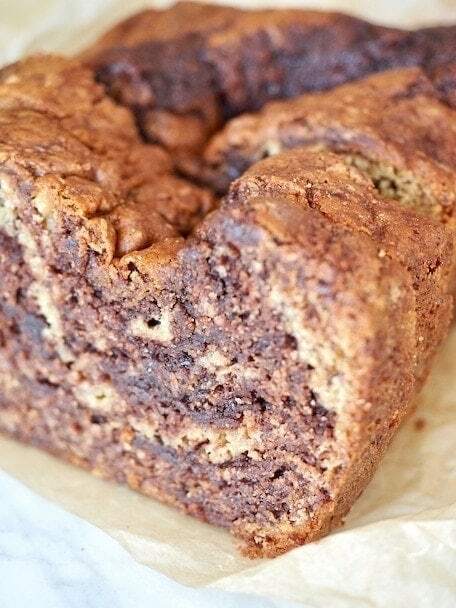 This amazing, mouth-watering, moist banana bread with a hidden ribbon of chocolate hazelnut Nutella beautifully swirled throughout the bread! Colorado had a tiny tip of the polar vortex, we had some chilly and snowy weather ourselves and I wanted to bake something delicious and warm to serve my boys after school one particularly chilly day. I was (abnormally) tenacious with this recipe — sometimes making quick breads at altitude can be tricky. Occasionally I like to add whole grains to recipes and sometimes they will mess with the outcome. Normally if a recipe doesn’t turn out just right the first time, I don’t repeat the process, but this bread was so stinking good — and me a non-Nutella lover — that I wanted to get it just right! I made this recipe three times in 10 days, tweaking it a bit each time to get just the right loaf. The first time it came out delicious, but it was really sunken and gooey in the middle. The second time I used light whole wheat flour and oat flour and I had to bake it forever, unfortunately the banana portion was dry, yet the nutella swirl was still very gooey. Most recently, I made it with unbleached all-purpose flour and oat flour, while it still sunk slightly, I am content as it was moist, evenly baked made a pretty loaf and the swirls were lovely when sliced. Despite the first “failed” attempts; all three test loaves were devoured by my family and friends! Nobody seemed to care what it looked like, just what it tasted like, that’s a winner in my mind. It might not win any quick bread competitions (are there such a thing?) but in the end if my family enjoys it, that’s what matters! I am always looking for new ways to use our too-ripe-to-eat bananas. Our oldest son is our resident banana lover, but he’s quite particular about their appearance and feel; any smooshy or dark spots and he’s ditching that banana, so needless to say we end up with a LOT of ripe and overripe bananas that I hate to throw away; so throughout the years, I’ve become a bit of a banana storing and preserving whiz. Keep your bananas in bunch, if they are still green, hang on a banana tree or place in a bowl alone until ripe. If perfectly ripe, simply place them in the fridge (produce drawer is ideal). The skin will darken, but this slows down the ripening process considerably. If really overripe, peel the banana and wrap individually in plastic wrap, place bananas together in a freezer bag. Freeze until ready to use. If desired, slice into smaller chunks to use for smoothies, muffins or breads. They do give off more moisture once thawed, you may need to slightly reduce your liquids in the recipe or add a tablespoon of additional flour, I personally haven’t had to do this step. Most bananas arrive at the store with a piece of heavy plastic around the top of the bunch. Apparently this causes the the gases produced for ripening to slow. No plastic? No problem; wrap a piece of plastic wrap around and secure with a rubber band. Everything you never wanted to know about bananas! Hee-hee! Nutella is another topic altogether; in my early 20’s I lived in “West” Berlin, Germany where I was an Au Pair for a family for 6 months. Yes, West, before the wall came down in ’87, fascinating time to live there! But that’s another story. I was first introduced to Nutella in Germany and since I’m not a HUGE chocolate fan I was a bit dubious about this hazelnut chocolate spread that I was slathering on toast and apples for the children. Fast forward 15 or so years after returning to the states and Nutella made an entrance into the American market. I was excited to share it with my family. It wasn’t nearly as thick, and was a bit sweeter and didn’t quite pack the hazelnutty punch of the European version, but for this quick bread it should work just fine! If you have the imported version you may have to soften it slightly before mixing with your batter. I’ll show you how to below. I’ve adjusted this Banana Nutella Swirl bread for altitude, but will provide measurements for both sea level and altitude in the recipe below. Line a 9×5 inch loaf pan with parchment paper, just squish it in there, smoothing any creases you see and folding the ends over the sides, this is so much easier than spraying a pan! If desired, lightly spray the parchment. Set aside. NOTE | I personally love my stoneware pan, it tends to heat evenly and brown beautifully, but bakes a bit slower. I actually do not own a plain aluminum pan, it’s on my wish list! I’m not a fan of my dark non-stick pan. 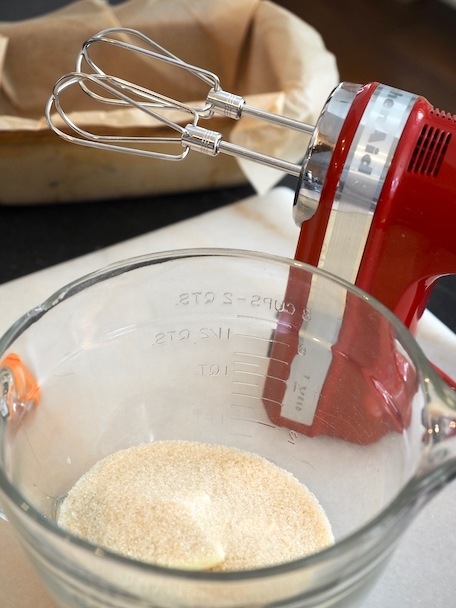 In a mixing bowl or bowl of a stand mixer, cream your sugar and butter, if using all natural cane sugar, cream for a minute or two in order to break down the grains of sugar. 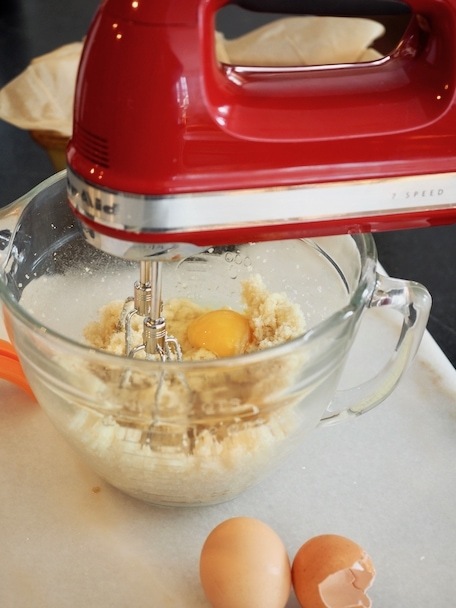 Add eggs, one at a time and mix on low speed for 1 minute each. It will have a bit of a curdled look. Scoop in your mashed bananas, vanilla and milk; mixing till combined. Using a sieve, place over top of batter and measure your all-purpose flour, oat flour, baking soda and salt into the sieve, sifting gently into the bowl. I use my wrist to make a back and forth motion, keeping the sieve as level as possible and using my palm on the other side of the bowl, carefully knock the sieve against my palm. Toss out any bits that do not go through the sieve. 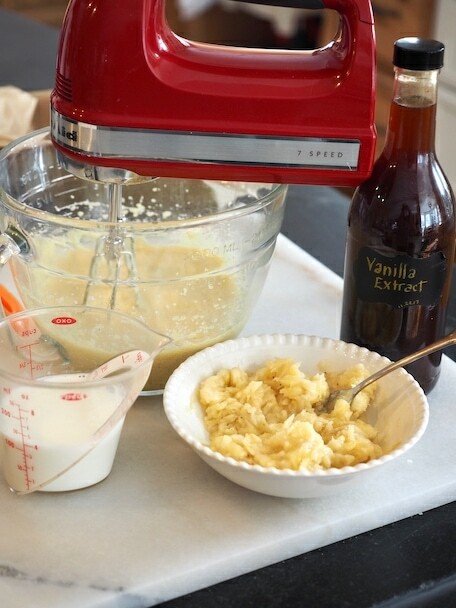 Mix gently until just combined, scraping to incorporate any rogue flour. In a small microwave safe bowl, scoop your (I love this 3/4 measuring cup) Nutella and microwave (if needed) for 15-20 seconds. 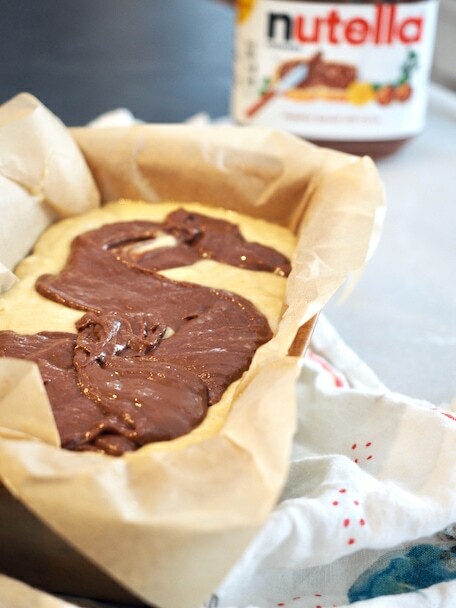 Stir 1 cup of banana bread batter into softened Nutella until combined. 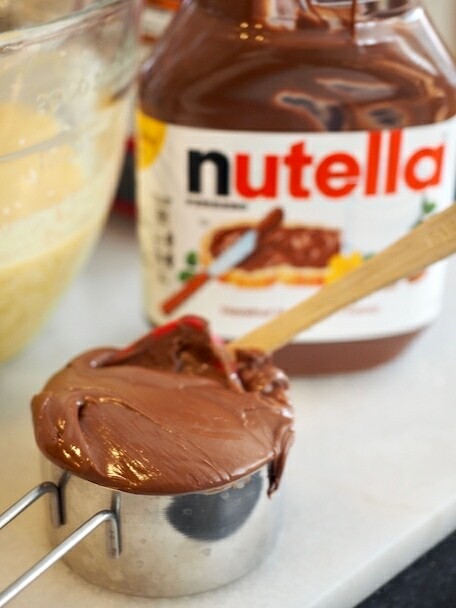 …then pour in balance of banana bread batter and finished with the rest of the Nutella batter. Using a chopstick, a knife, or a small wooden spoon handle — gently swirl the two batters. Don’t do so much you combine, you just want to swirl the two around. I found reaching down and slowly pulling up some of the batter using the chopstick while pulling the opposite direction worked well. Bake for 50-70 minutes, check loaf using a toothpick, be sure to insert into the chocolatey portion as well as banana. Using the stoneware pan, I had to bake for 70 minutes at 325°, I started checking on it at 50 minutes. Let cool in pan on a cooling rack for 15 minutes, then lift out of pan using parchment paper to cool completely. If your loaf sinks in the middle, all is not lost, it’ll be soft and maybe a bit gooey in the middle. 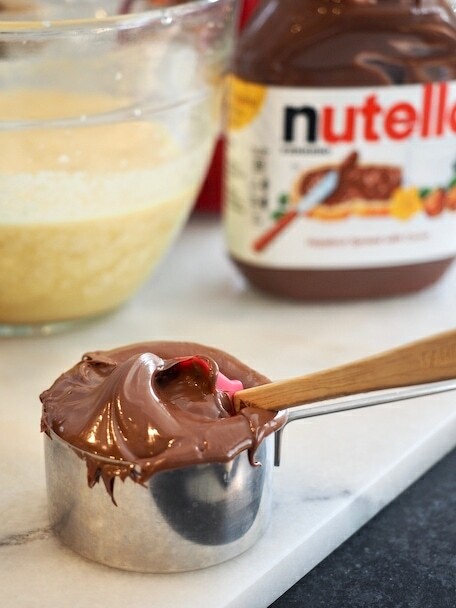 Delicious sliced and toasted under the broiler for a minute (watch closely), then slather it with butter, eat with a fork and dream happy, gooey Nutella thoughts! Loaf may be frozen for later use; or freeze half, eat half, give away half! And if you like this banana bread, try these banana recipes: banana graham streusel muffins or my banana graham bread! 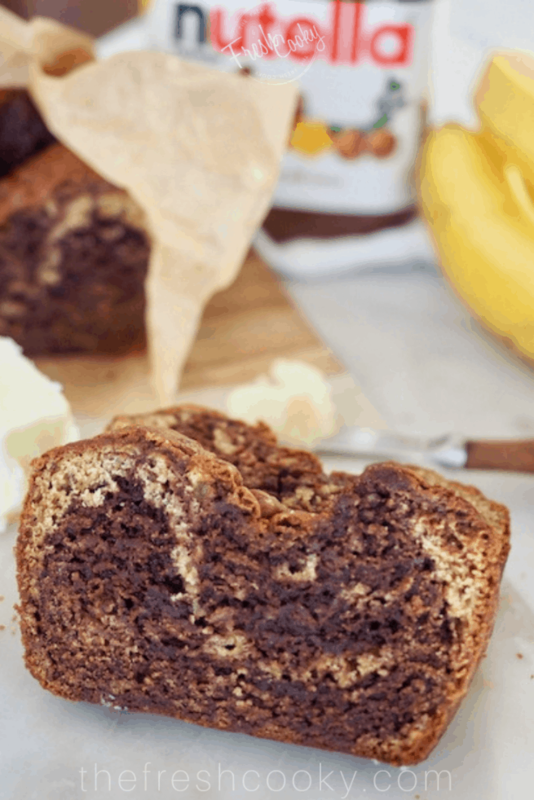 A mouth-watering, moist banana bread with a hidden surprise; a lovely swirl of chocolate-y Nutella in the middle. Line a 9×5 inch loaf pan with parchment paper, smoothing any creases you see and folding the ends over the sides, this is so much easier than spraying a pan! If desired, lightly spray the parchment. In a large mixing bowl or bowl of a stand mixer, cream your sugar and butter, if using all natural cane sugar, cream for a minute or two in order to break down the larger sugar grains. Scoop in your mashed bananas, vanilla and milk, mixing until well combined. 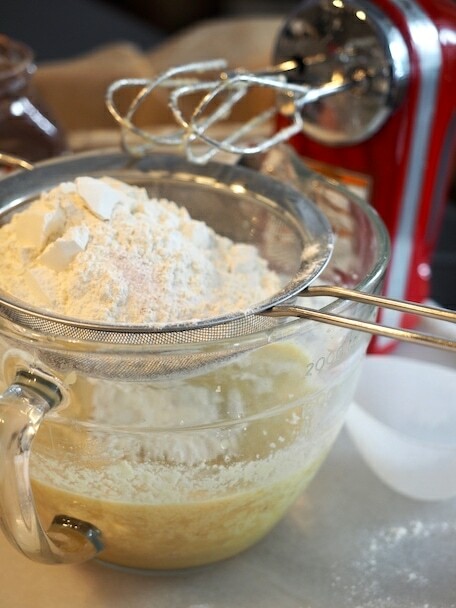 Using a sieve, place over top of batter and measure your all purpose flour, oat flour, baking soda and salt into the sieve, sifting gently into the bowl. In a small microwave safe bowl, measure Nutella and microwave (if needed) for 15-20 seconds. Stir in 1 cup of banana bread batter until combined. 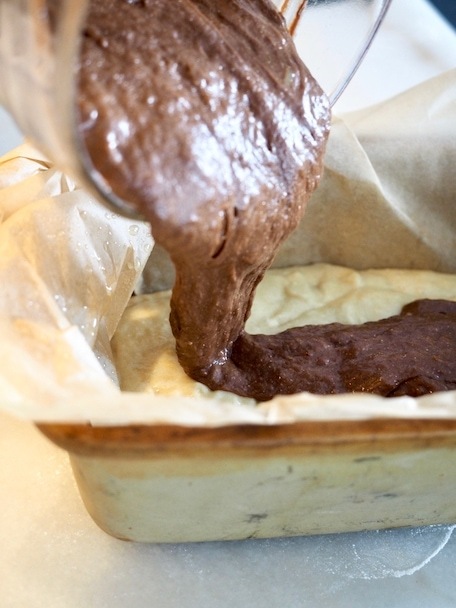 Spoon layers of batter into the prepared loaf pan, starting with your banana bread batter. I spooned a bit more banana bread batter first, then a good portion of Nutella batter, then balance of banana bread batter and finished with the rest of the Nutella batter. 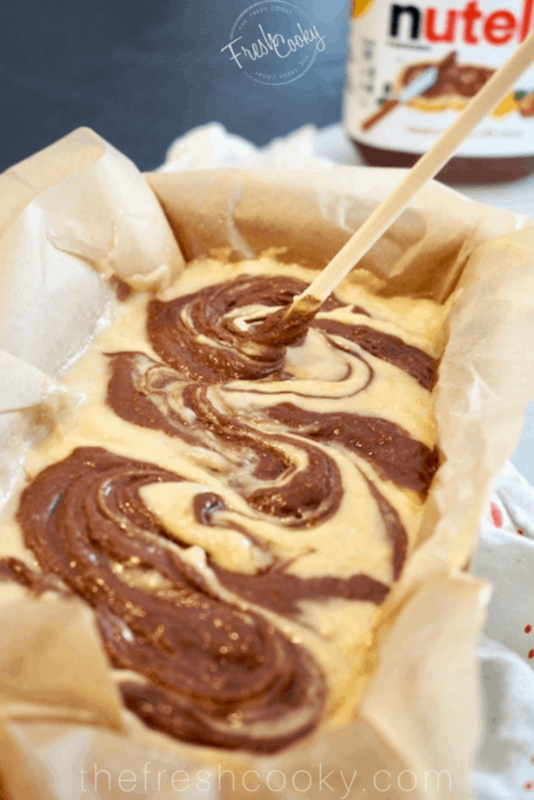 Using a chopstick a knife, or a small wooden spoon handle) gently swirl the two batters. Don’t do so much you combine, you just want to swirl the two around. I found reaching down and slowly pulling up some of the batter using the chopstick while pulling the opposite direction worked well. 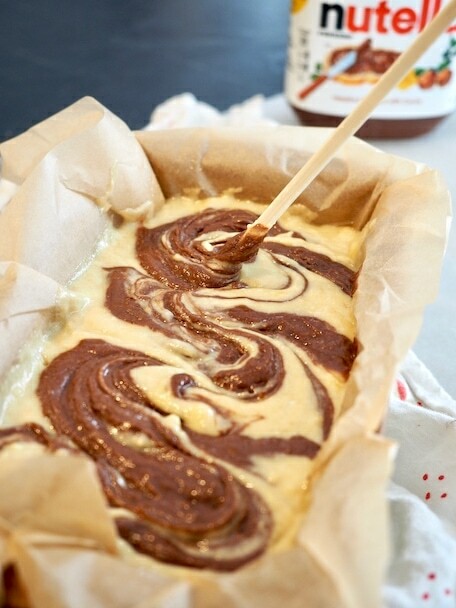 Bake for 50-70 minutes, check loaf using a toothpick, be sure to insert into the chocolatey portion as well as banana. Using the stoneware pan, I had to bake for 70 minutes at 325°, but started checking on it at 50 minutes. If your loaf sinks in the middle, all is not lost, it’ll be soft and maybe a bit gooey in the middle, but toast on a pan under the broiler for a minute, then just slather it with butter, eat with a fork and dream happy, gooey Nutella thoughts! Loaf may be frozen for later use, or freeze half, eat half, give away half! If baking at sea level or under 5260 feet your time in the oven will probably be closure to 50-60 minutes. Try using a light, whole wheat flour in place of the all-purpose flour, it may turn out a bit dry, but reduce time slightly in the oven, still tasty when toasted! NOTE | I personally love my stoneware pan, it tends to heat evenly and brown beautifully, but bakes a bit slower. I actually do not own a plain aluminum pan, it’s on my wish list! I do not like the way quick breads come out using my dark non-stick pan. YUM!!!!! I am with your son, the banana can’t have any hint of brown, otherwise it will make me gag! Too funny! He’s the same. Holly molly…sneak attack good. Better than Lentil soup? I agree, better then lentil soup but maybe not Leek soup?! ?